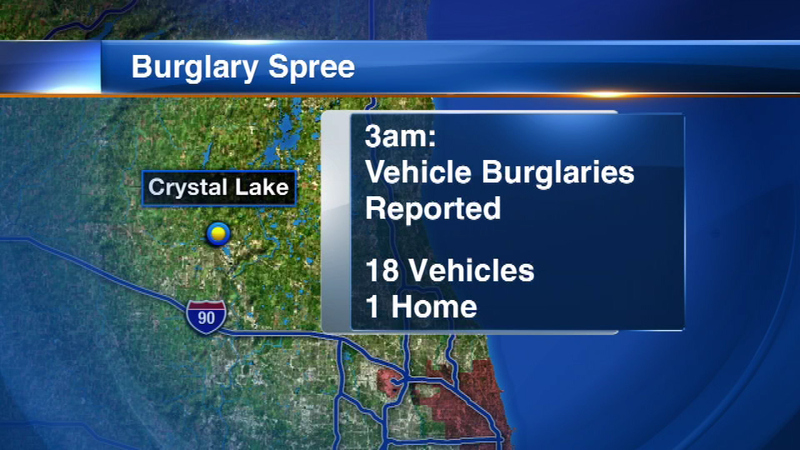 Police are searching for the person who went on a burglary spree in northwest suburban Crystal Lake. CRYSTAL LAKE, Ill. (WLS) -- Police are searching for the person who went on a burglary spree in northwest suburban Crystal Lake. Officers responded to a report of someone stealing from a vehicle in the 600-block of Leonard Parkway just before 3 a.m. Thursday. Police said 18 vehicles and one home were burglarized within the same area. The suspect had dark curly hair and was wearing glasses and a grey hooded sweatshirt, according to police. He may be riding a black bicycle.